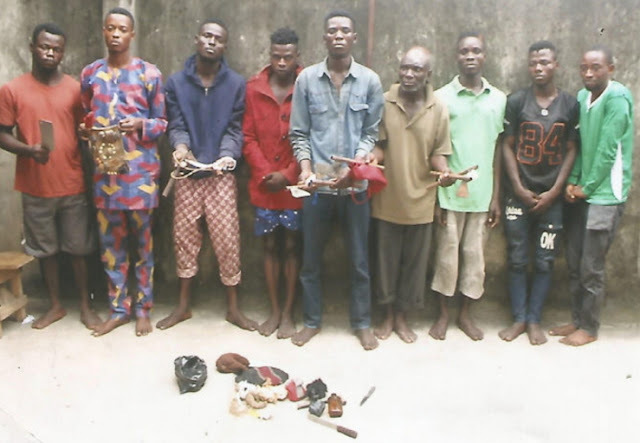 A police crack team led by DSP Festus Olaniyi of Lagos FSARS strike force unit 1 have arrested nine fleeing cultists a month after a raid on their hideout in Iperu Remo and Isara area of Ogun State. The suspects identified as 28-year-old Somoye Ibrahim, 17-year-old Fadimu Itilope, 24-year-old Muyiwa Kamiru, 29-year-old Owolani Dare, 19-year-old Ogundimu Sola, 27-year-old Boyejo Kehinde, Abiodun Ogunubi and 56-year-old Adenuga Nureni were arrested after two cultists identified as Adesola Simon and Adekunle Adeyinka led police to their hideout. Items recovered from the suspected cultists arrested during initiation ceremony at Iperu Remo and Isara area of Ogun State include charms, a cutlass, an hammer, 2 knives, and 8 battle axe. USELESS PEOPLE.IMAGINE THE OLD MAN AMONG THEM. OMG @iron bar I can see that old man with head like car front bumper!! !